Whether your a simple kind of person, enjoying a lovely light Continental platter or maybe you want a Full English with all the trimmings? Veggie or meat, we have it all! 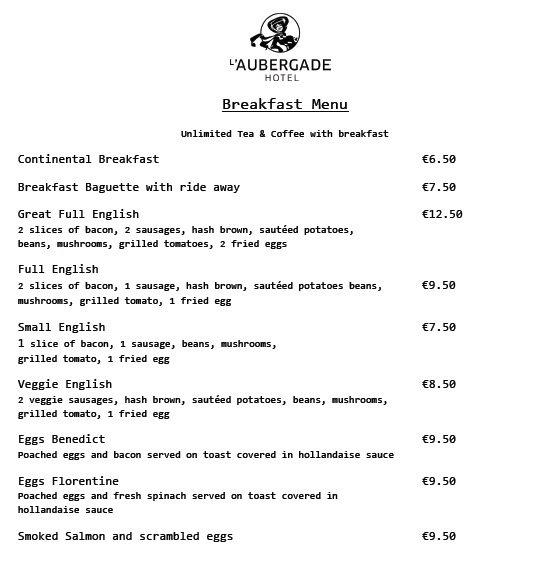 Take a look at this summers breakfast menu and come join us on the terrace at Hotel Laubergade, Morzine to get ready for the day ahead! All breakfasts include unlimited tea and coffee and our Full English also comes with a beer voucher so you can have a demi on your return! We still have some great prices on offer so come and stay at Hotel Laubergade this summer!